North Texas Giving Day is Communities Foundation of Texas’ annual 18-hour online giving event that provides nonprofits the opportunity to gain exposure to — and start relationships with — new donors, and for people in North Texas to come together to raise as much money as possible for local nonprofits. In addition, Communities Foundation of Texas and some nonprofits will host donation stations throughout DFW on September 14, 2017. Many such events will have entertainment and activities, food trucks and other offerings. Find a North Texas Giving Day donation station near you. 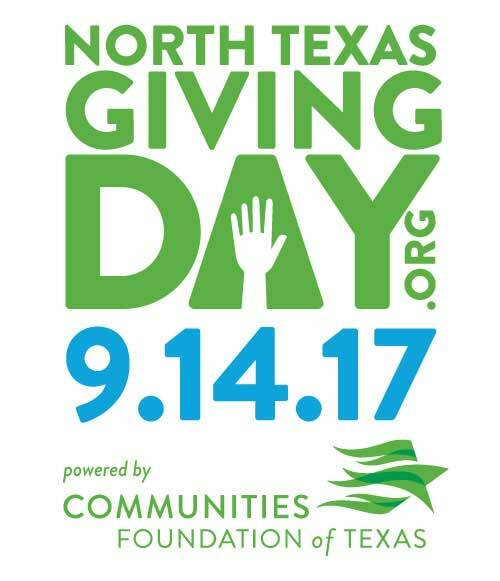 Since 2009, North Texas Giving Day has helped generate more than $156 million, for over 2,500 local nonprofits, in the North Texas Community. In 2016, $37 million was raised through more than 142,000 gifts benefiting 2,518 nonprofits. This is an important effort and a great way to help your favorite charities benefit. New this year, North Texas Giving Day kicks off a week early. Scheduled giving opens on September 7th at 8:00am and goes through September 13th at midnight. A launch event, Celebration of Giving, will kick off the community movement at Communities Foundation of Texas on September 7 from 5 p.m. to 7 p.m.
Additionally, many nonprofits are raising their own supplementary 1:1 matching funds to augment bonus funds and prizes raised by CFT and to further boost donations. Donations up to $10,000 made September 7 through 14 to the 2,500+ nonprofits listed on the site will be amplified by the general bonus funds and prizes. Nonprofits with matching funds will be shown on their own leaderboard on the North Texas Giving Day website so donors can follow their favorite nonprofit’s progress throughout the day. To see if your favorite nonprofit is participating or for more information on North Texas Giving Day, visit their website at www.NorthTexasGivingDay.org.